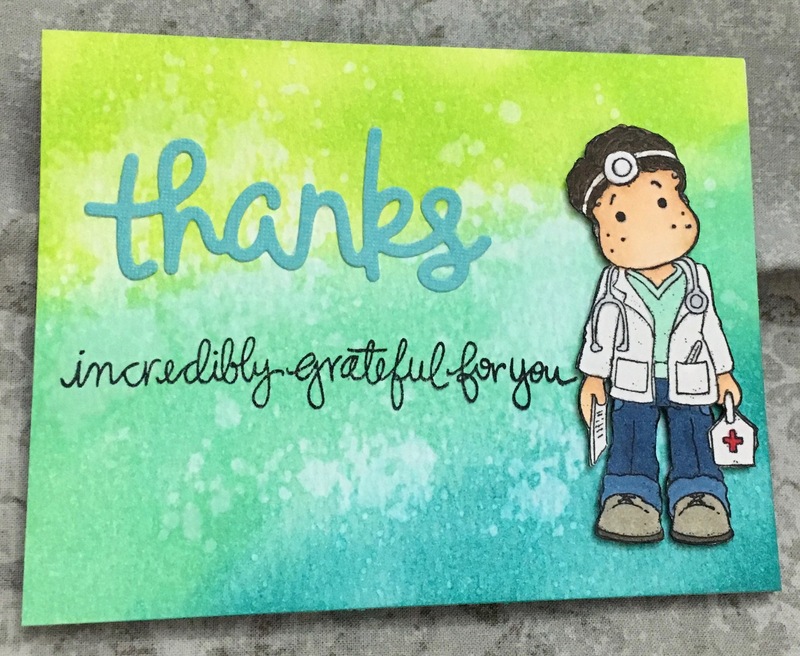 I created this thank you card for one of my doctors who has been treating me for a couple of years now, but has been taking a more active role in the past year. He had no idea I created a handmade cards and it was the least I could do to say “thank you” for all he’s done for me and is still doing for me. I had seen him before Christmas and mentioned I was in the middle of making my Christmas cards and he asked what I was talking about and I showed him a picture on my phone of the cards. I knew I was going to make him a card to say thank you for everything he had done for me this past year, it’s been a pretty rough year for me. I took a piece of Ranger Watercolor paper and used three Distress Ink colors, Peacock Feathers, Cracked Pistachio, and Twisted Citron and blended them into each other. Then I used the Distress Sprayer and spritzed on some water. Let the water sit for about thirty seconds then used a paper towel to soak up the water and it left behind a great water effect on the background piece. I took the Lawn Fawn Scripty Thanks Die and cut that from a piece of coordinating paper and stamped on the phrase “incredibly grateful for you” from the Simon Says Stamp Handwritten Sentiment in black ink. I stamped the Magnolia Doctor Edwin stamp in Memento Tuxedo Black Ink so I could color the stamp with Copics. Once he was colored in, I fussy cut the image out and used a Memento Tuxedo Black Ink marker and colored the edge of the image from the back so all the white area around the image was colored. I colored it from the back so if I missed the marker would hit the back of the image and not mess up the image that I spent so much time coloring. I then foam popped the image up and mounted the image to the front of the card. I mounted the background piece to a top folding white notecard with Tombow Xtreme Permanent Adhesive. 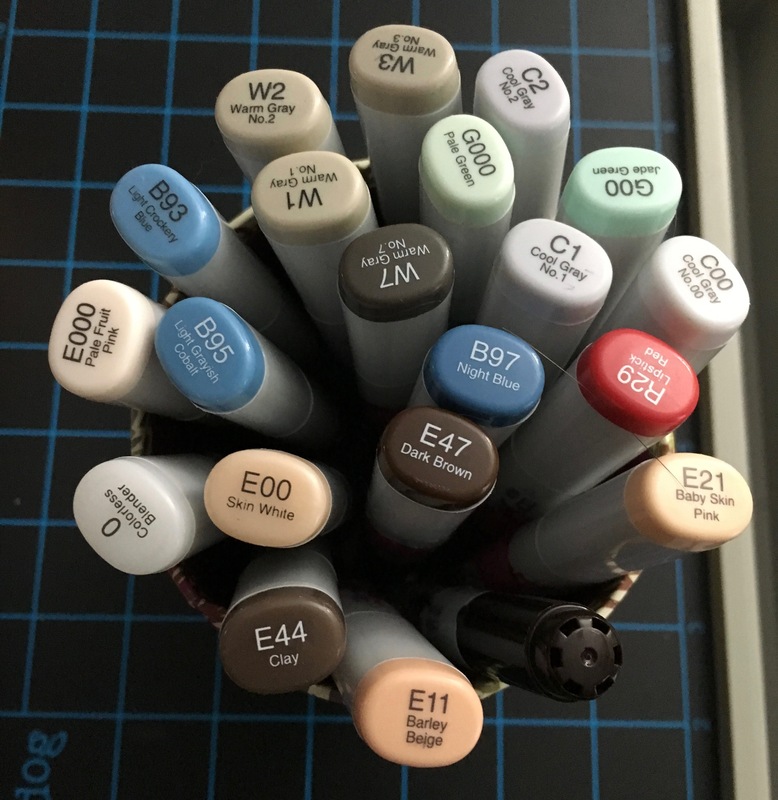 I wanted something strong to hold the watercolor paper and I love the Tombow Xtreme. 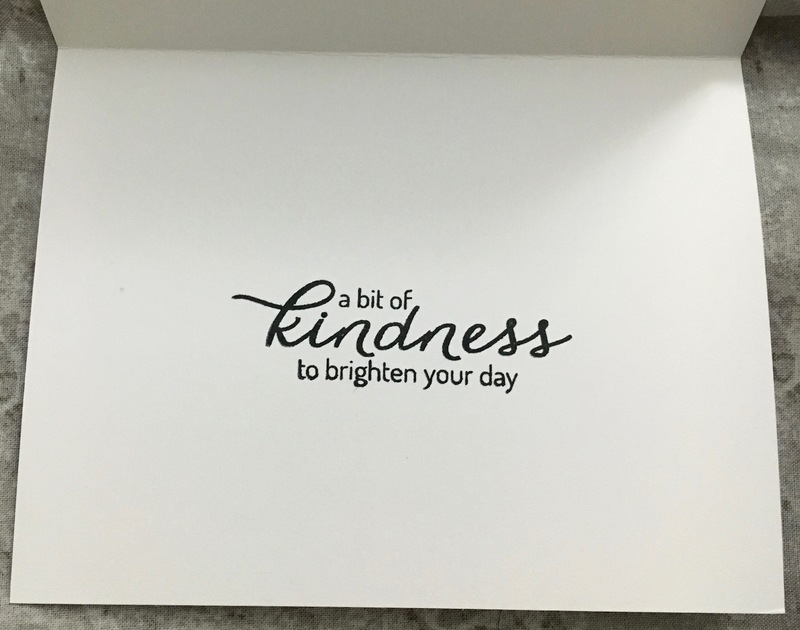 On the inside of the card, I used the sentiment “a bit of kindness to brighten your day” from Hero Arts Acts of Kindness clear stamp set can be found here. This is a great stamp set with 25% of the proceed from this set going to the Kind Campaign, an awesome organization that is working to end bullying. Hero Arts also has a wood stamp that they created for this campaign that can be found here.